How cool is it that we can finally start growing our own weed legally (in many places, anyway)? Even better is the potential of growing weed at little to no cost – certainly much cheaper than your local dispensary. Granted, if you’re trying to grow indoors, you’ll need the proper equipment to supplement the outdoor environment, but if you’re planning on growing marijuana outdoors, all you need is healthy soil, a safe and secure grow spot, and of course, some cannabis seeds to get you started. Can You Tell if a Cannabis Seed is Male or Female? Once you’ve amended your soil and secured a grow location, it’s time to sprout some seeds! Though many prefer procuring seeds from a seed bank to increase the likelihood of viability, bag seeds are definitely worth a go, but may not be as fruitful as store-bought seeds. Nevertheless, if you have a few marijuana bag seeds lying around, you should definitely try to sprout them. Here’s how. Generally, you can simply place your seed in some healthy soil or even rock wool cubes to start the germination process, but not being able to see your seeds sprout could leave you waiting indefinitely for it to never happen in the first place. To ensure your bag seeds sprout as easily as possible, we suggest soaking them in tap water for 24 hours prior to germination to encourage the breakdown of the nutritious seed shell. 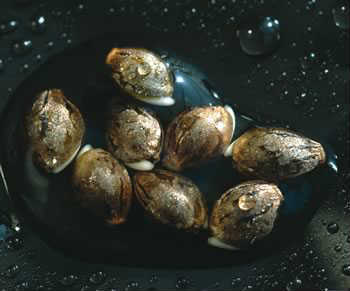 Example of seeds undergoing the germination process. After soaking the seed, simply place it on a damp paper towel under a warm (not hot) light. After a few days, you should see the seed begin to sprout a taproot. This indicates that it’s time to transfer the seedling into your grow medium where it can find more nutrients to flourish. Do so by gently placing the sprouted seed about ¾ to 1-inch deep in soil then cover it with more soil. Other grow mediums you can consider include rock wool, expanded clay, or peat moss, though these are primarily used for hydroponic grow systems. With a little effort, the seedling should soon push through the soil revealing its first set of “sucker leaves.” This is an exciting time as this is an indication of its impending growth; the sucker leaves are hungry for light and will absorb it readily to provide energy for future growth. Be sure your lighting is sufficient at this point as the bulk of your plants growth will depend on it. Check out this article to learn more about the best grow lights for your budget. We also suggest protecting your seedlings at this point because the slightest stress to their little bodies could kill them. Pests, pets, or simple carelessness could easily harm your seedlings so, until they are strong enough to withstand a little stress, enclose them in a plastic dome until they are at least a few inches tall. You can purchase plastic domes from your local nursery or grow shop or simply make some by cutting the top off a few 2-liter bottles and setting it on top of your babies. This will also help insulate your seedlings to minimize drastic temperature fluctuations. We certainly don’t want to discourage you from germinating bag seeds from your cannabis stash, but there are still some cautions you should account for. For example, even if you know the strain that the seed came from, you don’t know what caused the seed to be produced in the first place. If it was a male plant, it could pass on some of its traits resulting in an unknown phenotype. Whereas the bag it came from may have been an uplifting strain, its father could pass more lethargic traits to its offspring. The characteristics of your seeds can drastically affect the outcome of your grow. In that same vein, if a bag of cannabis contains seeds, it could be due to stress of the mother plant. When a female cannabis plant gets stressed, her natural response is to produce seeds as a means of evolutionary survival. However, hermaphroditic females (female plants that contain seeds) also tend to produce hermaphroditic offspring. In other words, growing from bag seed can sometimes result in seedy weed, even when given the best grow conditions possible. Also important to note is the unpredictable viability of bag seeds. If the crop was harvested before the seeds were mature, for example, or if they became damaged during the curing or packaging process, they may not sprout at all. Though this may not be much of a loss for outdoor grows, considering the cost if setting up an indoor grow, it would be a shame if the seeds didn’t take hold. To increase the likelihood of your bag seeds sprouting, keep your eyes peeled for healthy seeds. Growing our own medicine is a freedom that only a few get to enjoy. If you’re one of the lucky ones to live in a state where cannabis cultivation is legal, exercise your freedom by growing marijuana in your own home! Though you can certainly purchase seeds from a seed bank to increase your chances of success, many bag seeds will grow just as well (and save you a lot of money in the long-run). Have you tried to grow marijuana from bag seeds? Tell us about your luck.